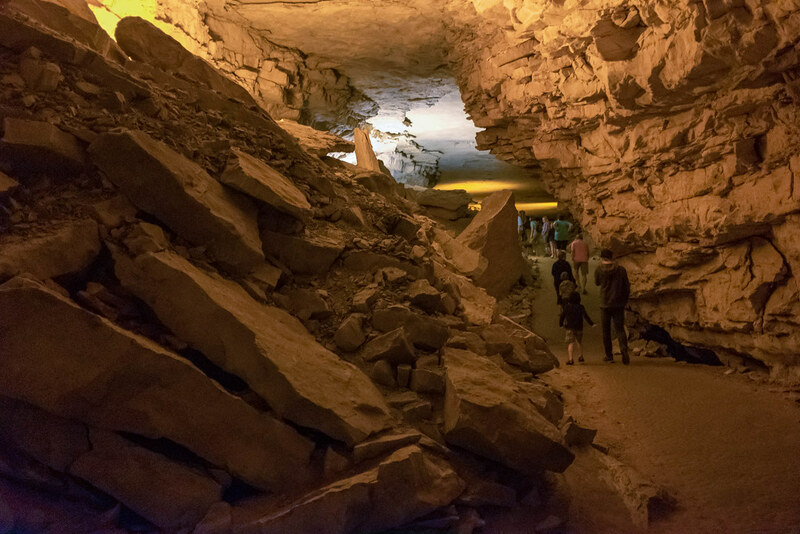 This photo was taken along the Historic Cave Tour in Mammoth Cave National Park during our 10-day family trip across the midwest United States earlier this year. As I mentioned in last week’s post the only camera I brought with me on this vacation was my Fuji X100F because I knew it would be small enough to bring everywhere we went but capable of handling almost anything I would want to take pictures of. Including, as it turned out, photos of near-dark caves hundreds of feet underground. I’ve been in the habit of shooting in JPG mode on my X100F because I quite like the Classic Chrome film simulation and found that if I get my exposure right in camera (which is easier to do thanks to an electronic viewfinder) I don’t really need to adjust anything in Lightroom. But walking in caves would require something more so I shot in RAW the whole time we were on these tours. There was almost no light at all down in those ancient tunnels save for some sparsely-placed incandescent bulbs at intermittent spots along the way, which meant I shot almost every picture with very little light at all. I took every picture at f/2.0, ISO 6400, and even then most of the images needed shutter speeds of 1/20 or slower just to get something even worth salvaging. This picture, for instance, required a +.8 exposure adjustment along with shadows lifted by nearly 100 and it still looks dim. Probably the trickiest part of shooting in the caves was the focusing, or lack thereof. Autofocus is not the X100F’s strong point and even in good light it can be a bit slow. (At least compared to my Nikons or pretty much every other camera available.) In the labyrinth of underground passages it was nearly useless and I had to focus manually at times which was also a bit of a sticky wicket because even looking through the viewfinder I could barely see anything. Most of the time I found myself autofocusing on anything even remotely bright which is what I did here–I focused on the white patch of light in the distance and hoped for the best. The results ranged from fair to midland with a couple standouts like this one here which I liked because the people (i.e. my son and his cousin) help give a sense of scale to the surroundings. I am impressed with this image. I can completely understand the challenge of shooting in the dark. Your Fuji did an excellent job at an ISO of 6400. Much better than I would have expected. Thank you again for explaining why you made the camera and editing choices you did. great composition, too.